Our race season has come and gone. With another year of no district race in our district, it comes and goes quick. Once again I was in charge of check in, software, and track setup. This is the second year with our new track, and things went pretty well. We had some issues with repeat offenders on wheel lightening, and a car come in with a stretched wheelbase (the scoutmasters sons car no less) that we had to deal with. Check in and rules enforcement is the least enjoyable part of the derby. Anyway the track record was lowered again this year. 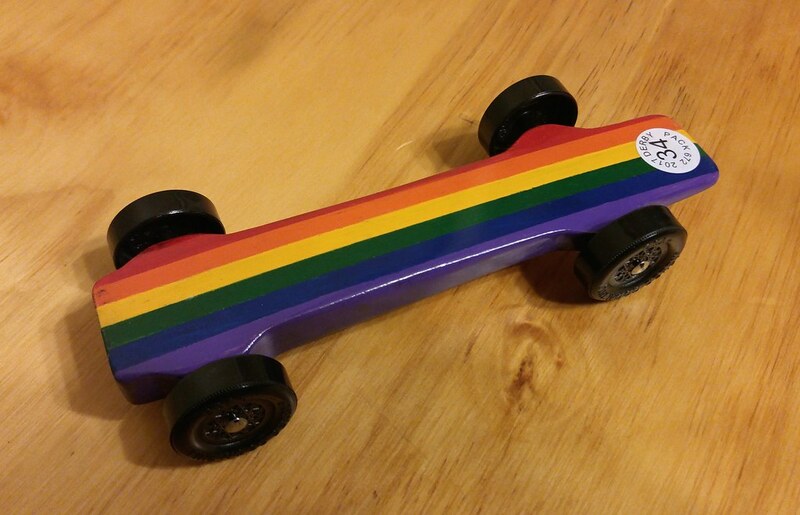 My daughters rainbow car (painted with brushed on Walmart acrylics and clear coated with Krylon spray 100% by her) set the track record early as the siblings raced first while we waited for a late Cub to arrive. She ran a 3.1109. Our rules are strict, 100% box stock wheels (no modifications other than bore prep), stock wheelbase and graphite. Her new track record stood all day until the last heat of the day (we ran 54 heats) which was when my sons car ran a best time of 3.1104 in his eighth and final heat of the grand finals. We have never had a car speed up as the race went on, so that was fun to see. My daughter actually ran the best cumulative 4 heat time of the day. My son had the best single heat and was fastest of the 14 cars in the "Grand Final". the second place car to him was second by only .003 second per heat in the average! Third place dropped off a bunch back to .047 seconds. It was really fun seeing the fastest two run neck and neck within .0005 seconds on one heat! Sorry to hear you've had to deal with rulebreakers. 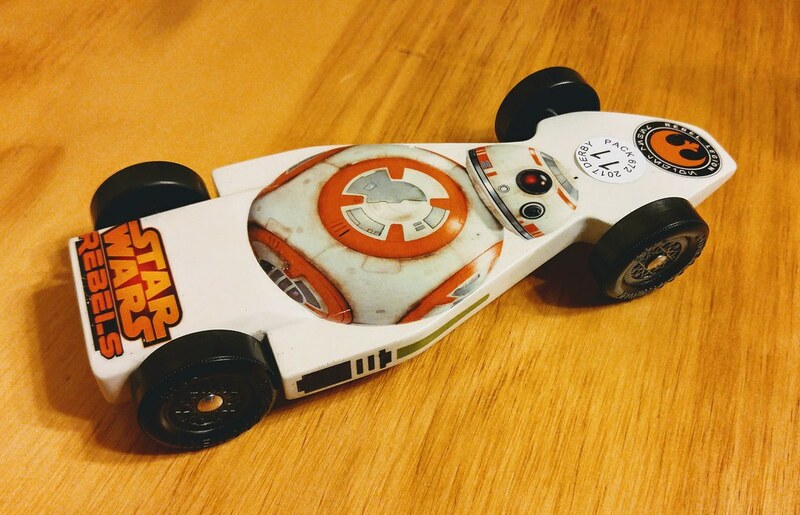 What did you end up doing with the illegal wheelbase car? Another track tech pointed it out to the Cubmaster and he denied that the front wheels had been moved forward. I showed it to him, in comparison to another car and he said he did not know it was an issue. I pointed it out in the rules, but admitted that I missed it at check in initially (my bad). He offered to re-drill them but at this point the race was an hour away. We took it to vote, and I relayed that the car was not going to be an overall winner based on other items that I knew were not ideal on the car. I told the committee that the car "Would not win based on just the front wheels being moved forward, but could be severely penalized by modification so close to the race." the committee allowed it to race as is. He ended up second in his den and fifth overall. last year I forced a family to take lightened wheels off of their cars and replace them with stock wheels we had on hand. The wheels were sanded round on the corners, but upon further inspection by me no lighter than the lightest stock wheels that can be found. The father has not spoken to me since, and his wife is on the pack Committee (I am also a den leader). Tech is not for the faint of heart. This year the wheels were again sanded, but the letters were still visible (barely) and the tread bumps could be felt (barely) so I let those cars go not wanting a repeat of the wheel swap debacle. Coincidentally this was the family that pointed out the wheelbase issue this year and wanted it corrected. Very nice looking cars you have there Got to love the Star Wars one for sure.